It’s with great pleasure that we introduce to you the new, PillowTalk Music imprint. 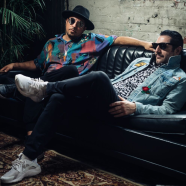 Michael Tello, Sammy Doyle and Ryan Williams celebrate their seven years together since the inception of the group in 2011 by starting their own label with the release of the first single, Hold Me Down off their upcoming sophomore album, All People scheduled for release Spring 2018. This is a big year for the band and in addition to the the new imprint, album, and full live show, PillowTalk is also excited to welcome to the group long time friend, ghostwriter, performer and DJ, Shane Duryea as part of the team. Adding to their already outstanding catalogue which has been released and shared on such labels as Visionquest, Life and Death, Wolf + Lamb and Crew Love, the new imprint will showcase original music from PillowTalk and also debut new material from some secret side projects the guys have been working on. Look for it to provide a platform for all kinds of other exciting musical endeavours moving forward. It’s been a minute since we have heard a new PillowTalk tune, and we are lucky here to get our hands on their new single Hold Me Down. Taking it back to grass roots, this three track digital single features a “Original Mix,” “Extended Mix” and a beautiful “Acapella.” It’s a nice tease as to what’s to come from this eclectic group as they venture into an unknown filled with endless opportunities that looks very bright. Hold Me Down is an emotive escape into a dreamy synth filled world. It keeps the bpm bumping just enough to work the dance floor while harkening back to the early new wave sounds coming from the likes of Depeche Mode, OMD and New Order. Sammy D’s natural baritone shines and fits perfectly with the arrangements created by fellow band mates Ryan Williams, Michael Tello, and Shane Duryea. While having a certain melancholy aspect to it, there is also a lush techno feel from the bubbling filtered synth that underlines the whole track. It’s that feel married to Sammy’s thoughtful vocals and joined by the ethereal harmonies of Hannah Noelle, who lends her angelic voice as a guest on the track, that make this one special. Think of Abe Duque’s aughts hit “What Happened” mixed with pretty harmonic synth chord stabs lending it an uplifting quality missing from so much dance music these days. A happy mix of dark and light, this is sure to play well in the underground club scene between the fall and winter months. It sounds good early in the night to build a room as well as a dance floor tool to bring down the house. Up on the horizon is the second single, Been A Long Time due on Valentine’s day in February and their full length album to be released in April. We don’t want to give away too much, but if you’re curious of what the band has been cooking up you’re going to have to pop into on of their live shows around the world where they are known for debuting new and unreleased goodies.